You join me standing in a warehouse district near Hiroshima docks. It’s a sub-zero morning and I’m wondering why I have, once again, turned my time off into work. Answering this question is the building across the street, and once inside it makes the early morning bullet train ride from Kyoto completely worth the effort. Although cruising through snowy Japan isn’t exactly a struggle. Despite my poor grasp of the language and some sketchy directions, it’s not difficult to spot Heiwa Motorcycles, what with all the bikes on the street outside. So I enter with iPhone and a translation app in hand, willing to decipher my phrases into blunt and often nonsensical Japanese. 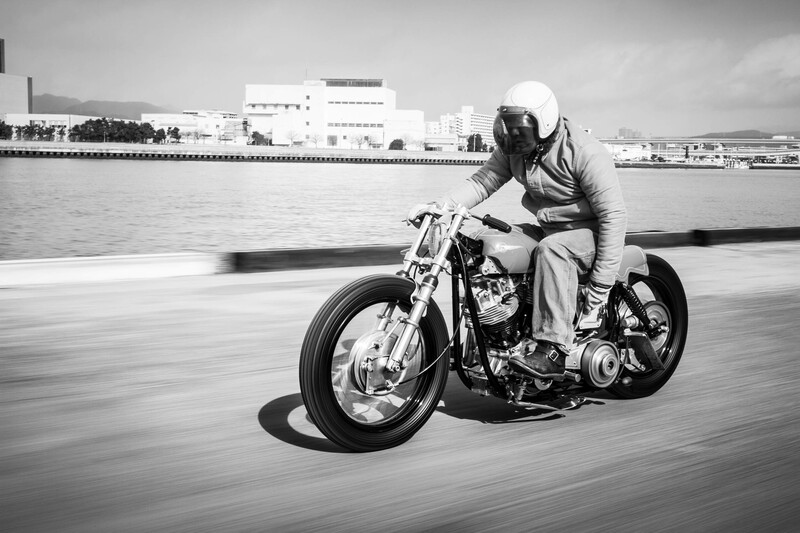 Heiwa Motorcycles (or HWC to locals), was founded in 2005 by Kengo Kimura, a custom bike builder who’s been gaining notoriety and numerous awards ever since. Row after row of trophy plaques cover his walls. The oldest on display is a ‘Best of European’ from the Yokohama Hot Rod Custom show for his creation dubbed ‘Green Peace’ – a stunning 1959 AJS Model 16. First question after I finished scanning the walls: what exactly does Heiwa stand for? I wasn’t quite prepared for Kengo’s answer. He explained, in his quietly confident manner, that the tragic events of August 1945 still hover over Hiroshima’s collective consciousness and therefore Heiwa directly translates to peace. Kengo then gracefully teats me to a tour of his workshop – a veritable gold mine for any bike enthusiast and a photographic Shangri-La for someone like me. Every angle had something interesting – from half-built machines to weighty-looking equipment. 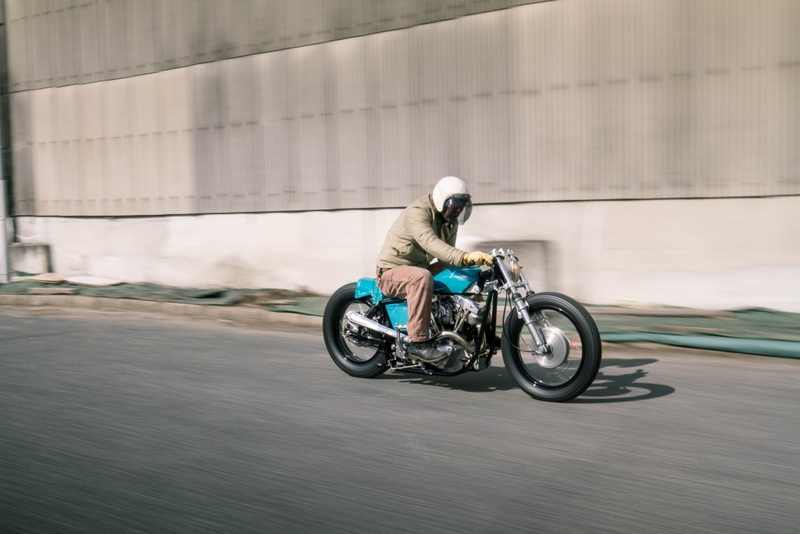 When asked why he started the business, Kengo states that he just wanted to do his own thing and realise the bikes that he imagined. Most builds start from British and Japanese models, although Harley-Davidsons are also popular. However, Triumph is undoubtedly Kengo’s favourite brand to work with. I’ll honest; this didn’t fail to spark a moment of patriotic pride. Introducing me to his mechanic Daisuke Noda, the topic changes from bikes to HWC’s customers. The pair explain that the typical buyer is fashionable and committed, because Kengo changes the look of his bikes according to “the customer’s style”. When so much time and planning goes into a project, customers have to be “committed to see a project through to the end”, he adds. The place is enough to have even a bike rookie like me drooling. 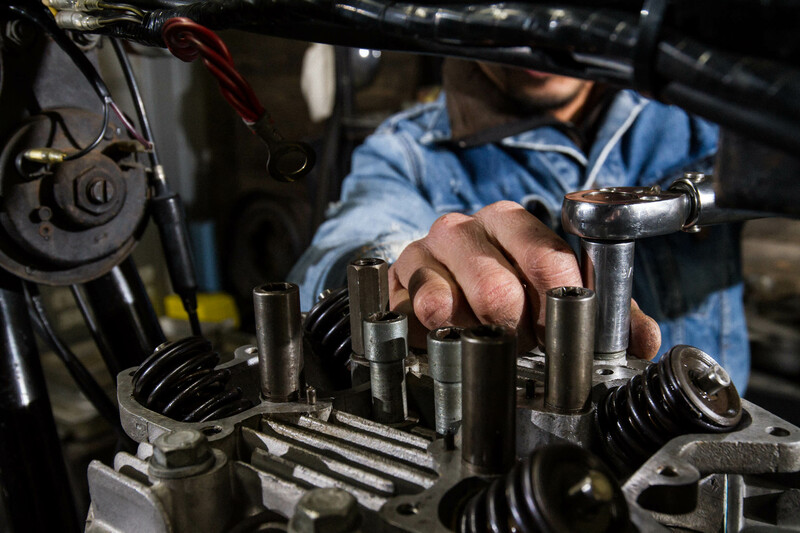 Motorcycles in various stages of build literally fill any space that’s not expressly needed for stripping, welding or painting. The walls are loaded with a cool mixture of Americana, parts and tools. 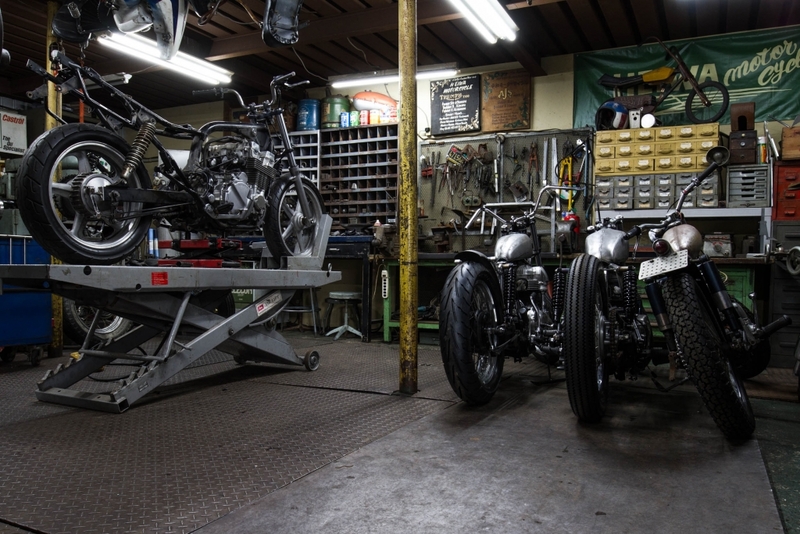 There can be no doubt that this is a workshop but it’s also a home to Kengo and his staff. They clearly live, breath and potentially sleep ‘bike’. While the main workshop is impressive, the real heart of Heiwa is the engine workshop. The almost hallowed space has a calm, Zen-like atmosphere when you step inside. 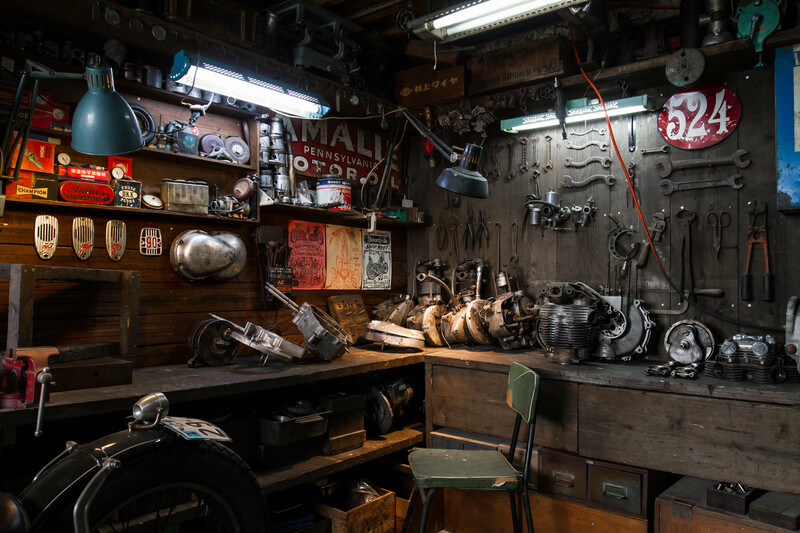 A workbench stands in the corner of the room like an altar and it is covered with engine parts, tools and unidentifiable bottles of oil and lubricants. It seems fitting that the place where the hearts of his creations are brought to life should be such a peaceful space, just like the company name. Having seen the birthplace of these stunning machines, I was desperate to get up close and personal with a finished example. Luckily, Kengo had arranged for a customer bike to be loaned back specifically for our visit. 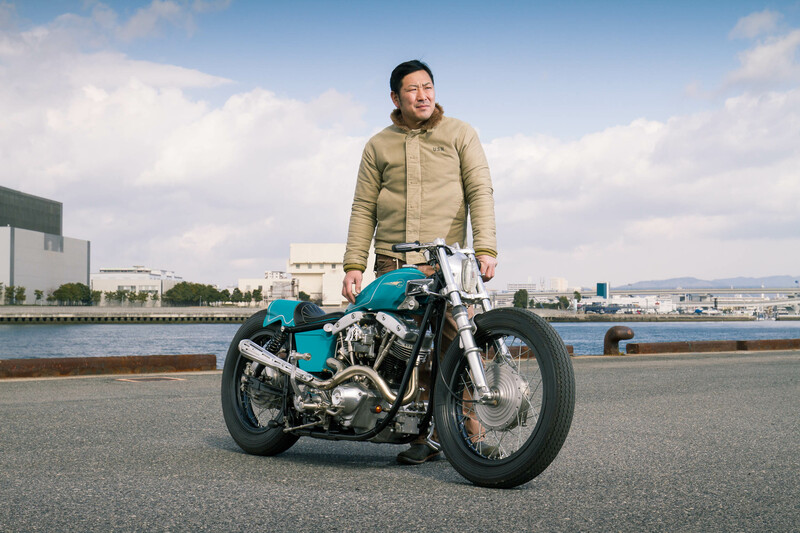 We are standing face-to-face with ‘Bull Pigeon’ – a 1978 Harley Davidson FX, which received the Heiwa treatment in 2015. 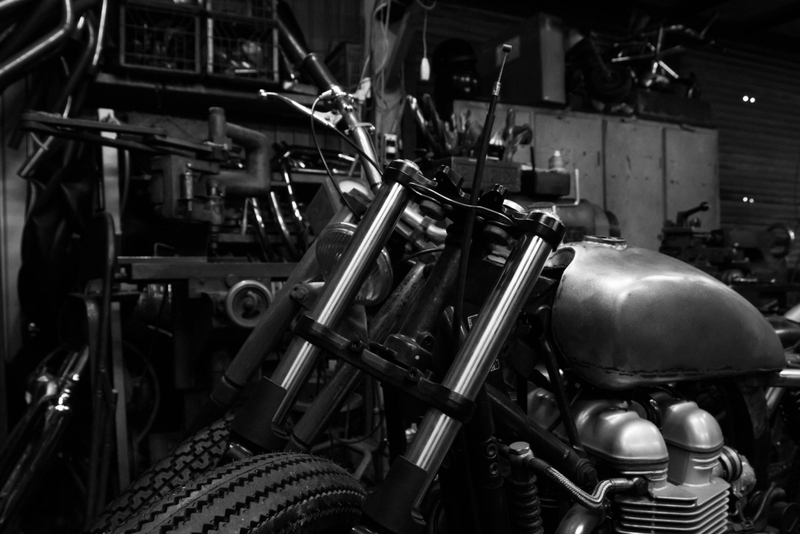 Before firing up the menacing-looking machine, Kengo and Daisuke did the honour of walking me through the extensive build: everything from the bespoke stainless steel bars to the hand-sewn leather saddle and the one of a kind muffler oozed attention to detail and class. However, my favourite modification was the custom TSU foot clutch combined with a hand-shifter on the oil tank. It’s a neat touch but also a throwback that definitely helps separate the men from the boys when it comes to rider skill. The level of customisation was truly baffling and we didn’t have enough time in the day to discuss absolutely everything that was tweaked on this glorious machine but suffice to say, the build sheet I was later sent stretched over two pages of A4. The photos I was most looking forward to capturing were moving shots out on the streets with Kengo and his creation. We teed up Daisuke to drive me around on the flatbed of the workshop truck but, after discussing the legal ramifications should the police notice our antics, it was agreed that we would cruise around the surrounding warehouses to keep everything low-key. However, I’m not sure how ‘low-key’ a white guy kneeling on the back of a truck while being chased by a howling motorbike actually turned out to be. The real difficulty was explaining that I needed the truck to be in the oncoming lane to get the shot. But like with everything on this shoot, enthusiasm and hand gestures ruled the day. It wasn’t until later that the clutch/shifter setup had been explained to me, so when I saw Kengo predominantly riding one handed, I assumed it was a style thing. We were trundling around the docks with me hanging from the flatbed, dodging lories, oncoming traffic and potholes. Little did I know that Kengo was actually shifting with his spare hand and trying to keep the bike stable at low-speed.